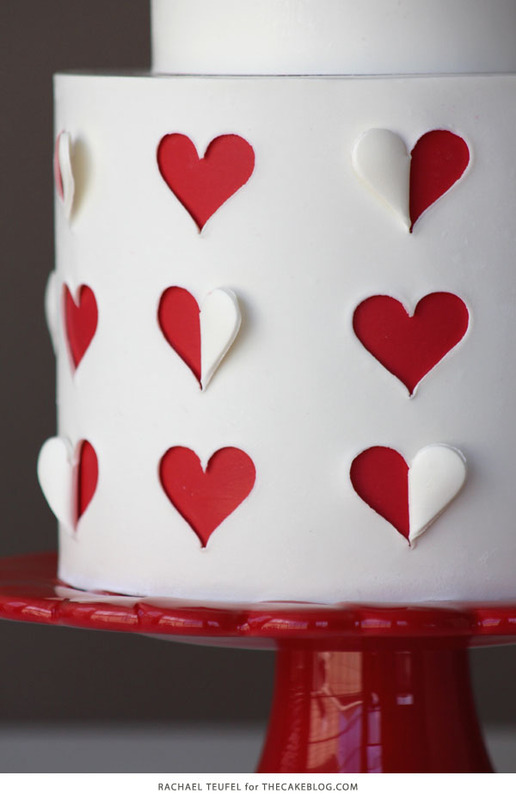 Heart Cut Out Cake – make creative cuts to reveal a colorful heart pattern on this Valentine’s Day cake! 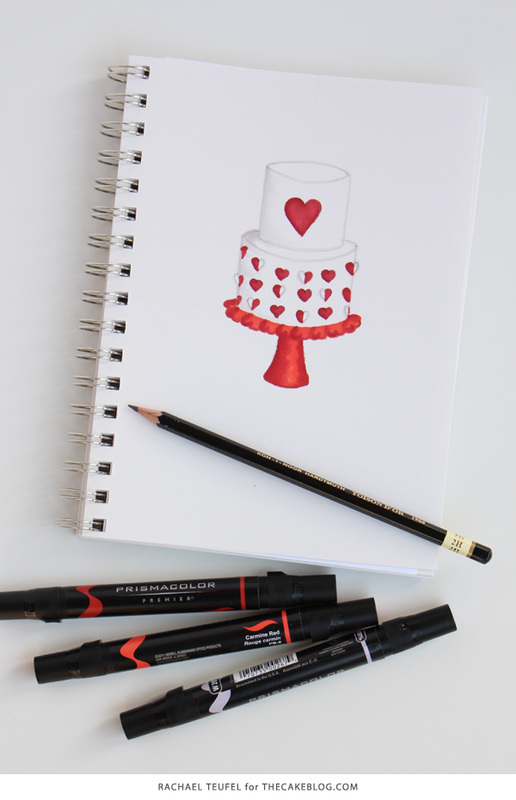 A new cake decorating tutorial by our contributor, Rachael Teufel. It’s that time of year when I start thinking about what kind of Valentine’s card I can help my son make for his teacher. As always, I turned to Pinterest for inspiration and very quickly found several ideas… for both paper projects and for cakes, of course! I tend to get distracted dreaming about the cake design possibilities. 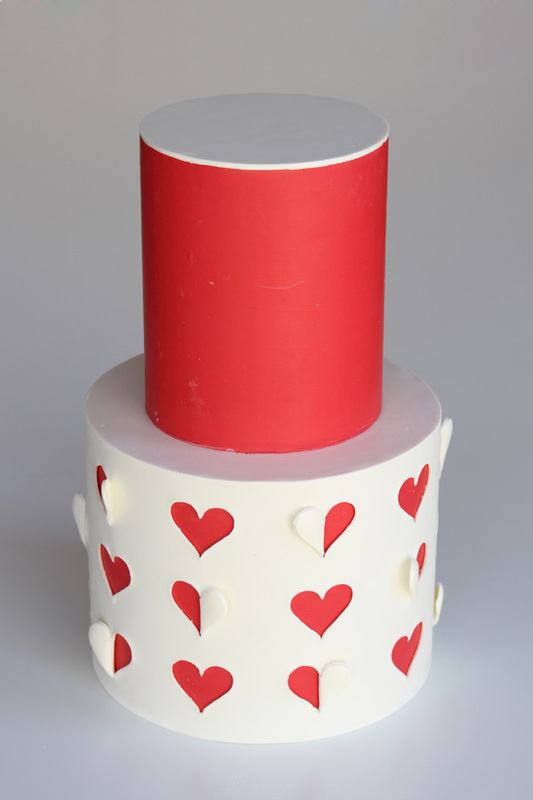 Heart cut out projects, like this Valentine’s wrapping paper, translate perfectly to a cake design. And what better way to say I love you than with something sweet. 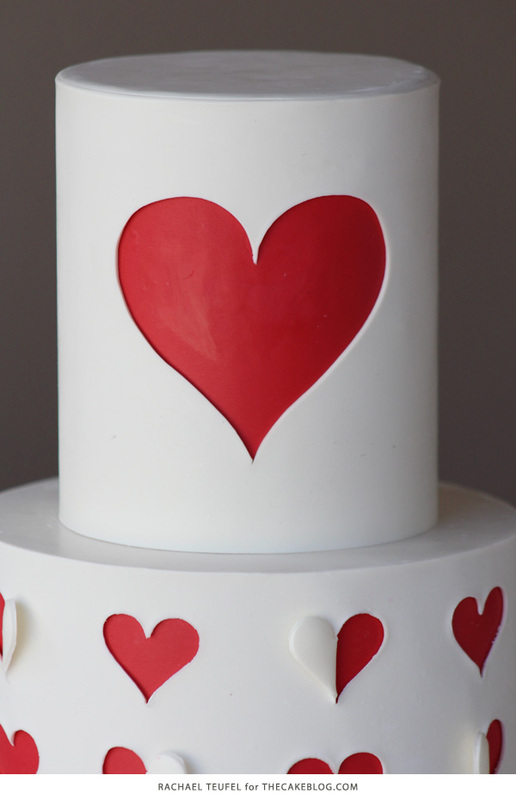 I’m excited to share this super fun and cute Valentine’s cake with all of you. We’re using my color reveal cutting technique to create a layered heart look that is sure to impress. I’m including an easy to use template so truly anyone can create this cake. 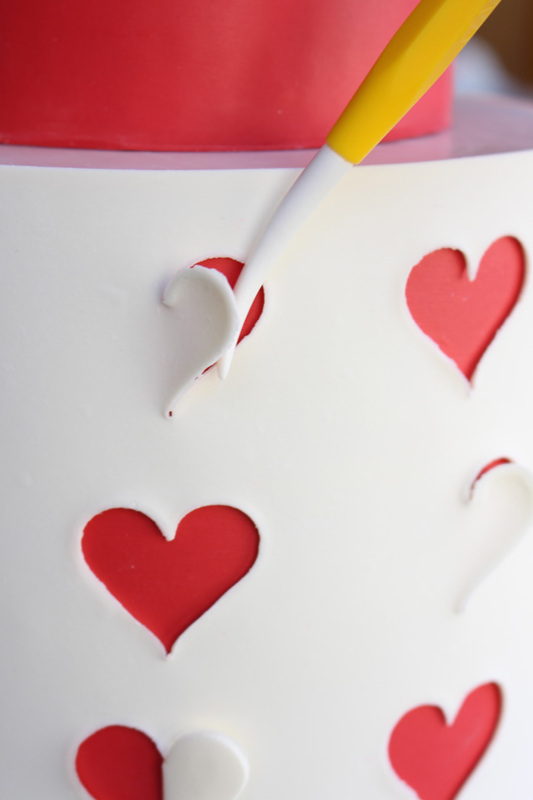 This technique can be used on a cake covered in buttercream, ganache, fondant, or modeling chocolate. The key is making the underlay a different color from the overlay. 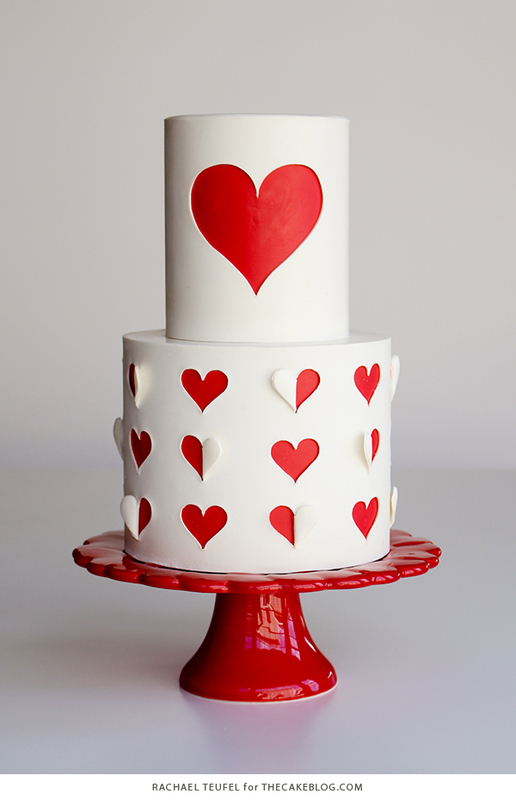 The cake I have created is paneled in red modeling chocolate on the sides and white modeling chocolate on the top. 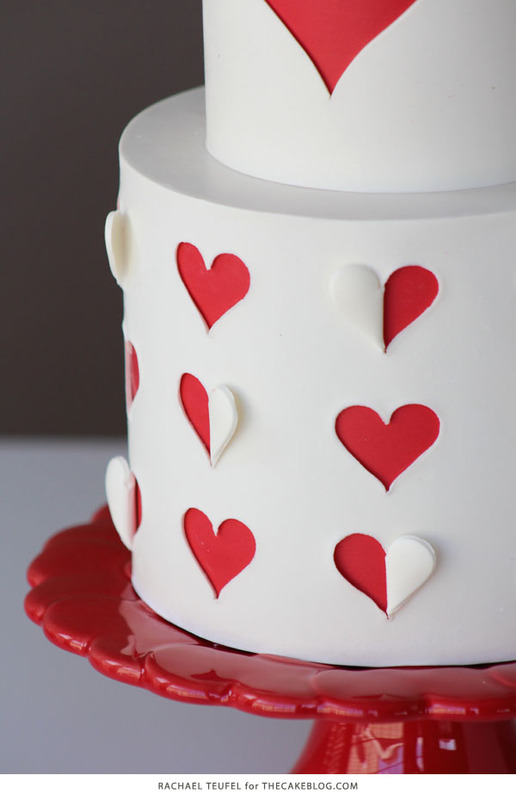 To create the heart reveal overlay, first measure the circumference and height of your cake at it’s tallest point. 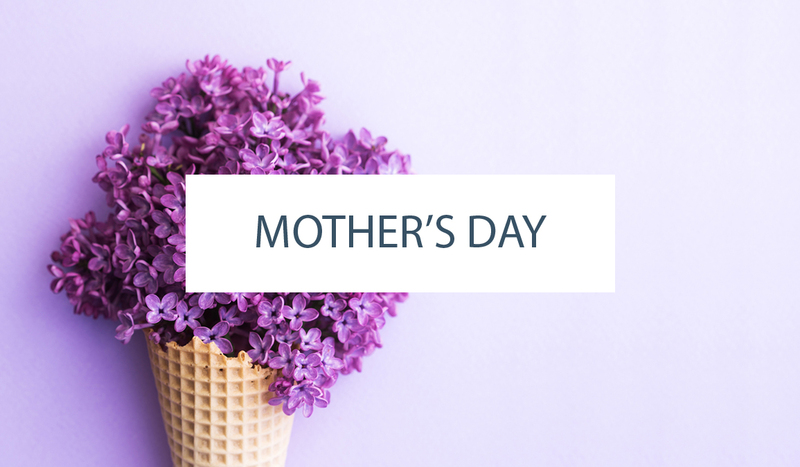 You’ll need a strip of white modeling chocolate long enough to fully wrap around your cake and tall enough to cover the top edge. Dust your workspace with a light coating of powdered sugar so that your modeling chocolate does not stick. Using a rolling pin, roll out your modeling chocolate to an 1/8” thick or less. TIP: a pasta machine can be used to easily roll out your modeling chocolate, if you have one. Start by cutting a straight line along the bottom of the modeling chocolate panel. Measure and cut the top edge erring on too tall versus too short. TIP: I like to use a self healing mat and yard stick for this to save time compared to measuring with a ruler in several places. 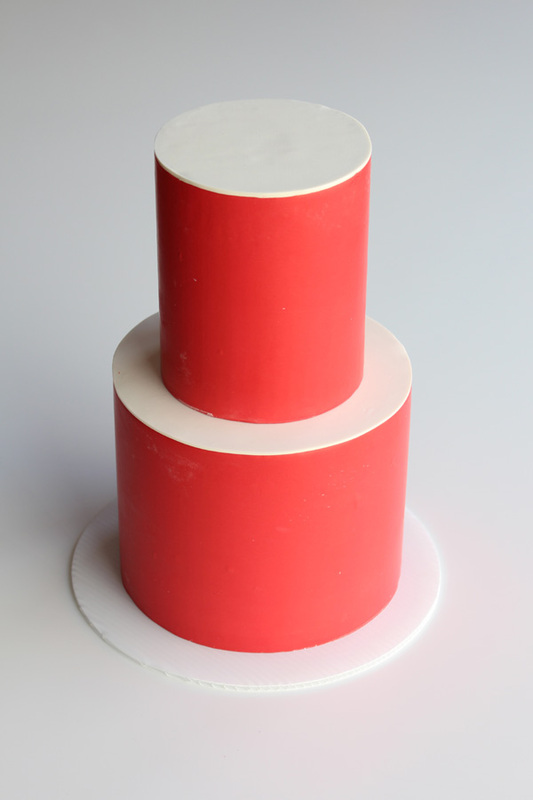 Print your template for the bottom tier (download HERE). Trim the bottom edge, and lightly coat the back of the paper with shortening to prevent sticking. 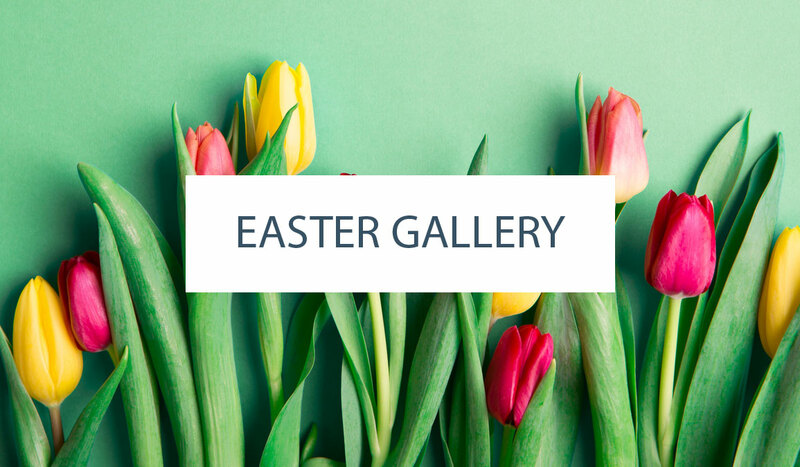 Line up the template on the bottom edge of the modeling chocolate and adhere. 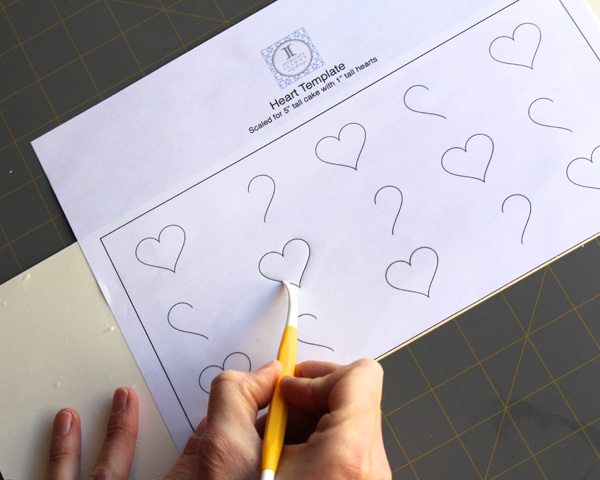 Using a veining tool (or the tool of your choice), trace the heart pattern onto the modeling chocolate. 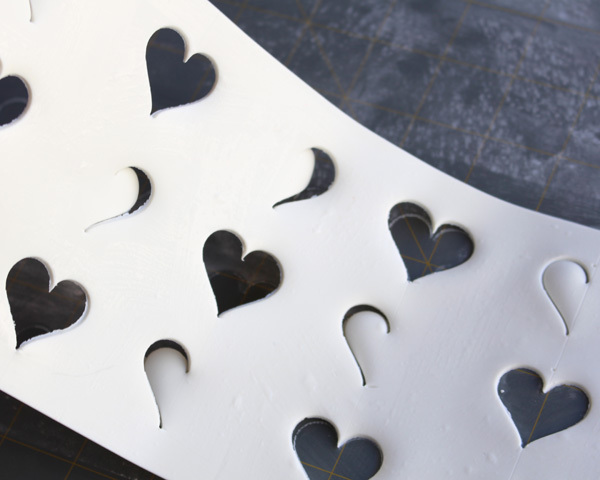 SHORT CUT: If you are using the heart reveal cutters, simply place the cutter over the template and press down to imprint the pattern. 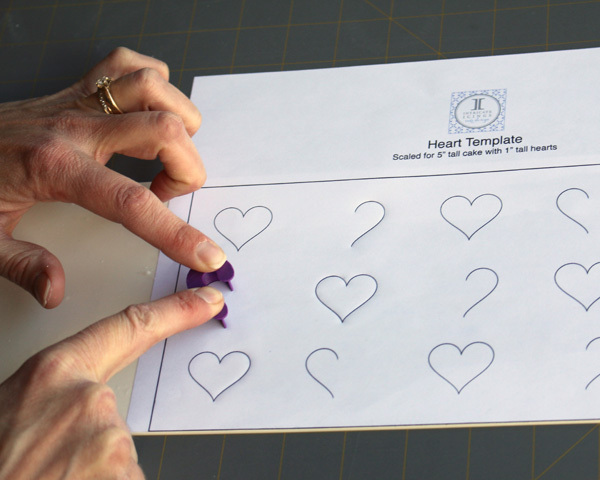 Whether you traced the hearts or used the cutters, make sure you’ve imprinted each heart on the template. 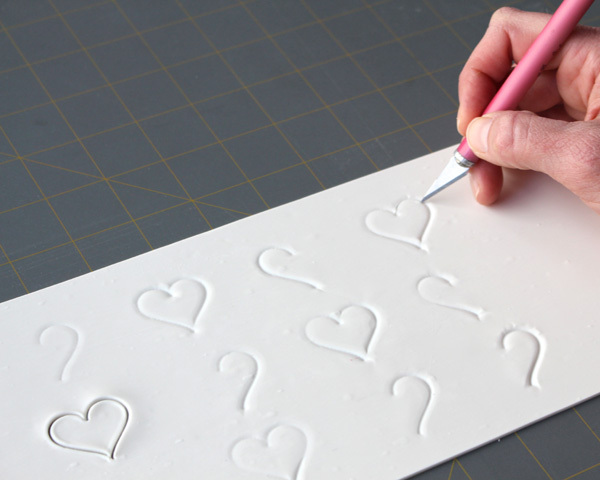 Remove the paper and cut the imprinted lines with an X-acto to reveal the heart pattern. To adhere the panel, apply water lightly to the back of the panel, leaving the half hearts dry. We don’t want those to stick. Place the panel around the cake, lining up the bottom edge with the bottom of the cake. Gently apply pressure to adhere the panel, being careful to not press on the half hearts. Trim the panel to meet at the back. Gently rub the seam together. Trim the top edge if necessary. Once adhered, carefully open the half hearts. 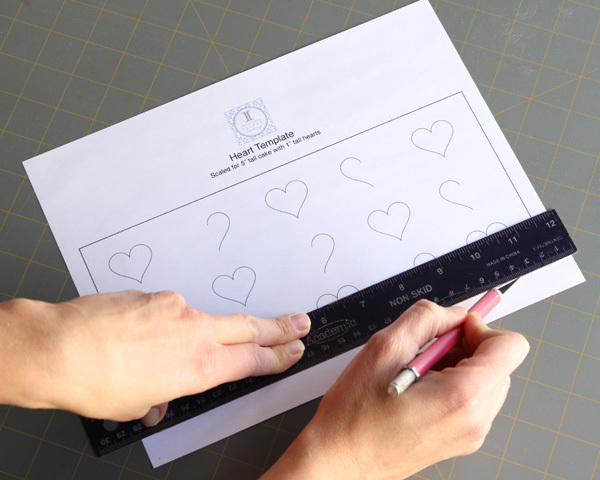 To create the top tier, follow the process above to measure and cut the panel, prep the top tier template, trace, and cut out the heart. Adhere and trim the panel. I encourage to add your own special touches to this design by writing a message inside the open heart, changing the color scheme, or playing with the heart pattern. 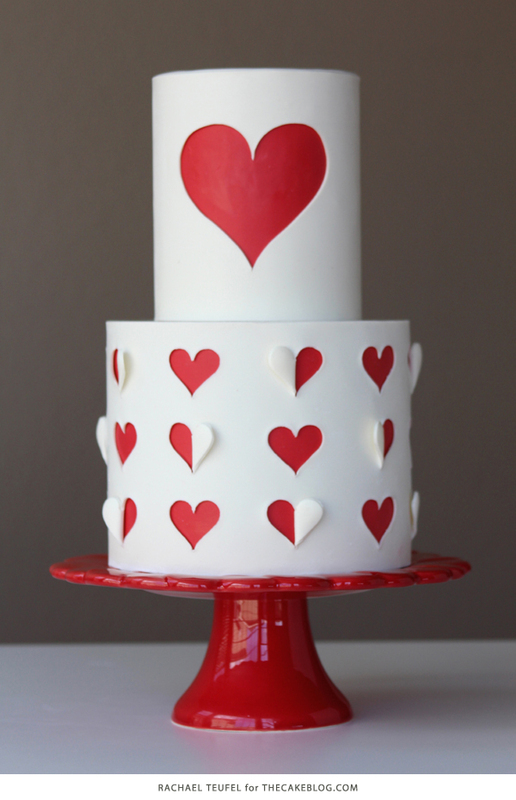 Rachael Teufel is the owner of Intricate Icings Cake Design. She sees potential for edible art everywhere, so you'll rarely find her without a sketchpad in hand. Read more about Rachael on her bio page. 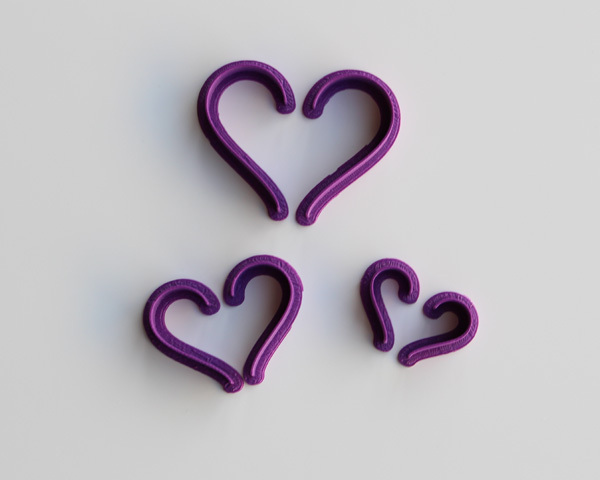 Can I use fondant or fondant mixed with tylose, instead of modeling chocolate? Thank you!